Task: Delegate physically demanding and monotonous tasks, such as removing old adhesive labels, polishing and packing, to industrial robots. The robots needed to meet the company’s efficiency requirements and, in the case of the palletising robot, pack various awkwardly sized shrink-wrapped onto pallets for shipment. Solution: Install a FANUC M-20iA/10L ROBOT equipped with iRVision and suction grippers to complete the palletising; install a FANUC M-10iA ROBOT equipped with a Force Sensor to complete the polishing tasks. Result: Palletising at Fastlog is now fully automated and despite fears of employee resentment due to concerns about potential job loses, PALETTI, as staff call the M-20, has proved a welcome addition to the team. Likewise, the polishing cells have proved to be a popular addition. As with palletising, in the past health-related issues frequently led to downtime. Now however, the robot carries out the polishing process non-stop in a dedicated cell. Downtime is a thing of the past, with consistently high quality being maintained by the FANUC Force Sensor. Fast, precise, and on the money! State-of-the-art companies can no longer afford to make compromises in terms of speed and quality. Automation of complex or even individual processes is a key to success in this area. For strenuous tasks, a robot is the perfect colleague, providing ready assistance to employees. At the company Fastlog AG in the Gwatt (Thun) plant, both FANUC robots of the type M-10iA and M-20iA/10L lend a helping hand towards extending the service life of electronic devices, even basic units such as modems, and afterwards the robots package them perfectly on pallets for customer shipping. Fastlog AG is a company that was re-established in 2009 with over 100 years of tradition from the former PTT Group and currently employing 140 people in service and logistics of spare parts for its business customers. In this niche business, the objective is to increase the lifecycle even of basic used electronic devices such as modems or set-top boxes from the IT/telecommunications sector and to make them available to the market again, fully inspected and tested. In fact, each device in the "Fastchecker" is tested and inspected in detail, polished, cleaned and newly packaged again. This "refurbishing" saves the manufacturers lots of money and ultimately reduces the burden on the environment. "Fastchecker" is a clear solution for the rapidly-growing demand in the Swiss market, and Fastlog revolutionises the after-sales business for electronic components and systems with this FANUC M-20iA/10L palletising robot, given the nickname "PALETTI" by its co-workers. As all devices at Fastlog are completely inspected at modern measurement workstations and receive the latest software updates, the finishing touch in the sequence is the refurbishing of the covers, whereby the cover has to be gently and carefully finished and polished, as modern plastic covers do not forgive any minor flaws. Repairing each device manually or removing old adhesive labels: These are physically demanding and monotonous tasks. Marcel Hadorn, Operations Manager/Head of Services at Fastlog explains further: "That is why we decided to deploy a robot from FANUC for these tasks, on the one hand, to take a load off of employees and on the other hand, to meet the efficiency requirements." How did the collaboration come about? The polishing was one task, and the palletising of the completely refurbished devices was another. Hadorn explains: "We discovered the company Derap AG, which has its headquarters nearby, and we had them prepare sketches of initial routines and requirements. We were quickly convinced that we wanted to use a robot for palletising. Then the company FANUC was suggested to us. What convinced us about FANUC was seeing the direct applications of its plant in the nearby location of Biel/Bienne." Together with the integrator Derap AG from the nearby town of Heimberg (BE), a detailed requirements specification was prepared. The initial focus was on the palletising robot M-20iA/10L, the application of which is standard today in many companies and which very quickly achieved the desired result for Hadorn and his team. A key parameter in the requirements specification was the cycle of 12 devices per minute, which was also successfully achieved. Thus, Marcel Hadorn and the consultant team led by Peter Keller, CEO of Derap AG, was on the right track: "We were very quickly convinced by the precision of the robot applications, although for the palletising process, you don't need tolerances of tenths or hundredths of a millimetre", confirms Hadorn with satisfaction. "Although there were certain challenges during commissioning, we were able to quickly correct them by coordinating the stacking of the boxes. The system, including the sensors, works perfectly", he adds. Peter Keller, CEO of the engineering firm Derap AG, explains from his perspective why robots from FANUC were the right choice: "We received the cycle times and the different desired palletising patterns with tight tolerances as a specification from Fastlog. Thus we looked for the appropriate robots that were able to fulfil these tight specifications. This already narrowed the search considerably." The crux of the matter was optimally placing many of the different shrink-wrapped and thus not always perfectly geometrically-shaped device packages on the pallet with eccentric suction devices to ensure that there will be no production interruption, and that the load won't shift during road transport. The iRVision system in the unit delivered by FANUC is "also very well matched as a component, which was an additional decisive criterion for choosing FANUC robots." Close cooperation for quick solutions. Thus, the palletising was somewhat more difficult to master, given more sophisticated processes. But we saw that the originally planned polishing system was somewhat easier to implement by comparison. The development of the polishing system went relatively quickly. Hadorn added: "With the polishing system, we were able to reach our goals within the deadline we set for ourselves. Here even more personnel savings can be achieved than on the palletising system." An important point for him was also "the fact that the Derap company provided us with superb assistance in deciding on the robot models M-10iA and M-20iA/10L from FANUC. We defined the requirements in terms of weight, speed, and workspace conditions on the systems, then based on a recommendation by Pierre Rottet from FANUC, and in cooperation with the people at Derap, we opted for these specialised devices." Bürki Electric AG from Steffisburg was responsible for the networking, installation and programming of the PLC controller and the vision components of both systems. Short distances and local companies working hand-in-hand combined to lead this close project collaboration to rapid solutions. "We were very pleased to see how so much expertise could be built up in such a short time, and we are now capable of programming the new palletising system ourselves. It is important for us to have in-house expertise for the program adaptation. There are already new ideas, and we are looking forward to additional cooperation with the companies Derap and FANUC." On the M-10i palletising robot – today named "PALETTI" by the employees – different design approaches were originally discussed. It quickly became clear that a continuous application of force would be necessary for the difficult polishing process in order to guarantee consistent quality. This was achieved with the force momentum sensor by the company FANUC, "which runs very homogeneously and smoothly. We are satisfied how the whole project was organised", confirms Hadorn. Also for Pierre Rottet, sales manager for robots at FANUC, this M-10iA robot in combination with force momentum sensor is quite unique: "This sensor communicates directly with the robot controller, thus we are able to guarantee that the contact force exerted when polishing the housing will always be the same. This offers the advantage that you can achieve consistent quality in this polishing process. On the other hand, there are significant time savings during programming, i.e. when teaching the movements. The force momentum sensor thus always carries out the programmed movement with the same contact force." This polishing process is in fact something special in the application. Pierre Rottet is certain: "It can also be used to demonstrate to other customers that FANUC robots and the force momentum sensor enable the implementation of machining solutions like these, involving process engineering. The unique features with FANUC are the options for integrated solutions: Peripheral devices such as image processing or force momentum sensors etc. are proprietary FANUC products and can be integrated into the robot controls very easily in a "Plug and Play" concept. I believe that technologically this is really something that can be used in the future, also for other industrial applications." The entire polishing process of plastic housings containing sensitive electronics is generally a very delicate process, as is the rapid packaging of completed package onto the pallets. "Our employees are grateful that these tasks can be taken over by robots today", Marcel Hadorn is certain. After all, automation and robots, subjectively speaking, are also subject to criticism: "We initially had concerns about deploying these robots in our production, because after all, they ultimately eliminate jobs. But remarkably, this was well received by the employees and the mood is surprisingly positive. The palletising was a very strenuous task, especially in the summertime. Also well received from our staff was the polishing robot, as there were frequent health-related downtimes on this system. This was a sign for us to take the load off the employees. There have not been any complaints from the employees that they no longer have to do this strenuous task", says Hadorn. This means automation with robots dovetails with a more environmentally-friendly and resource-conserving (working) world of tomorrow, which, all in all, requires new solutions, especially due to the high-wage price pressure for Swiss companies, particularly given the heightening competitive situation with Europe and the Far East. 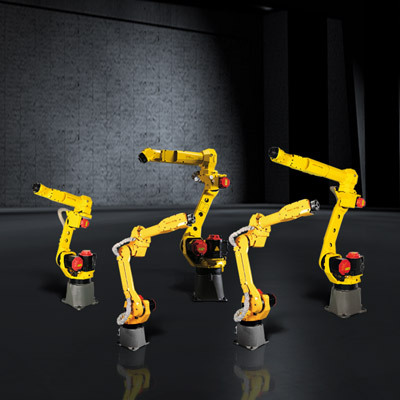 FANUC Switzerland also considers this forward-driven project highly successful: "With this project, we have gained not only the company Derap as a system partner but also the company Fastlog as a new end customer, who is now using robots in production for the first time. This certainly will not be the last project. That is why for FANUC Switzerland, it is naturally a very important and also a successful project", summed up Pierre Rottet and Claudia Scheidegger, Marketing FANUC Switzerland, standing at the polishing cell, where their M-10iA is whirring continuously and rapidly from modem to modem.